#BlackMonday – case of black and white? The farmers have called on all South Africans to wear black in commemoration of those killed on farms. What started out as a plea from a close friend of a farmer recently killed in Klapmuts, outside Cape Town, for South Africans to wear black on Monday, to show they have had enough of the scourge of farm murders turned into a racially charged debate which played itself out on social media and other platforms. Chris Loubser’s video that went viral depicted his heartbreak after Joubert Conradie, a 47-year-old wine farmer, was killed by armed robbers just hours before South Africa’s annual crime statistics were released. Dubbed #BlackMonday, the protest gained support from AfriForum, a civil rights group, agricultural unions, and the Cape Chamber of Commerce and Industry, and political parties, among others. Highways were blocked off across the country as farmers used their lorries, trucks and tractors to force a glo slow for motorists in a bid to have their pleas heard. Placards reading — Stop Farm Murders, Staan op teen plaasmoorder (stand up against farm murders, and even crosses bearing the words ‘Rest in Peace’ were carried as thousands raised their alarm. While the protests were happening, live tweets from people of different races and political backgrounds signalled just how divisive the issue of land, agriculture and crime is in post-Apartheid South Africa. The presence of the old South African flag, a symbol of Apartheid and the violence inflicted on the black majority, inflamed anti-#BlackMonday sentiment among both white and black South Africans. “Using the apartheid flag to protest murder is beyond ironic,” tweeted Mike da Silva. Another video posted on Facebook showed a white woman saying she felt more protected under the old flag than the new. Even Arts and Culture Minister Nathi Mthethwa was forced to respond. “We strongly condemn the racism on display at the #BlackMonday protest with the brandishing of the apartheid flag. This is unacceptable,” Mthethwa tweeted. The issue of land, a political hot potato, also took centre stage given that much of the country’s arable land remains in the hands of the white minority, with many blacks despairing of their lives in dense townships. Others felt that highlighting farm murders, was counterproductive. “South Africa has about 19,000 murders a year. This year 71 farmers have been murdered. Why not simply march against all murders,” tweeted Keith Adam Mahommed. The recently released crime stats show 19,016 murders were reported in South Africa during the 2016/17 financial year. Of this figure, 74 people were killed on farms — with some describing this as a drop in the bucket, while farmers’ rights groups interpreted the data as indicating as many as 156 farmers murdered per 100,000 people compared to the 34 per 100,000 overall. Criminologists however say there is no accurate data on exactly how many people live and work on farms, making it difficult to correctly analyse stats. Leader of the Freedom Front Plus, MP Pieter Groenewald, one of the biggest critics of government’s rural safety strategy, said the perception created was that just white farmers were victims of farm attacks. Groenewald believes farm attacks was one of the biggest risks to South Africa’s food security. Growewald believes that were farmers not to take extraordinary measures to protect themselves, many of the 638 attacks on farms in the last financial year could have ended up in murders too. Former African Farmers’ Association of South Africa secretary general Aggrey Mahanjana said while farm murders were worrying, it did not affect black farmers as badly because of the skewed pattern of land ownership in the country. “Out of every 100 farmers who have private farms, there will be two black people,” said Mahanjana. Mahanjana believes the killing of white farmers is due to owners not knowing the people who work for them. “Our workers are our neighbours, are our family people. They won’t come and kill you,” he told African News Agency (ANA). 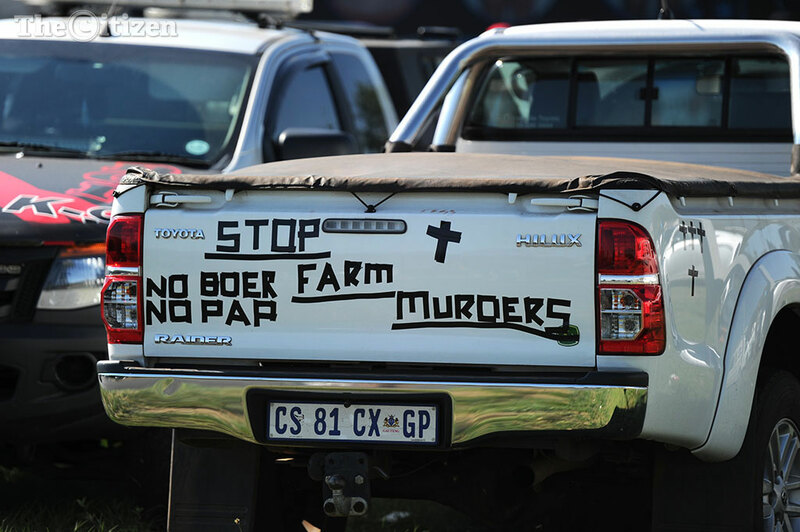 Whatever the reasons for the farm attacks or how serious different South African view the issue, it appears to have triggered some candid debate among the citizenry – both rural and urban. 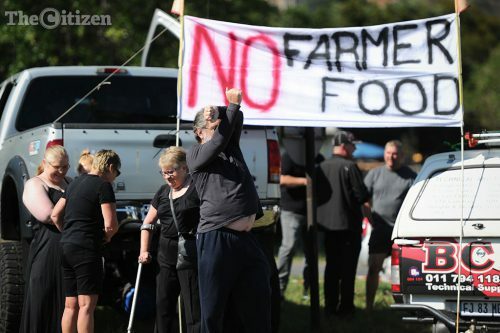 Farmers believe those carrying the old Apartheid flags, signifying a time when whites were better protected than blacks, are but a few and that if farm attacks are not addressed, the country faces the very real propsect of losing a productive and vital cog in the economy. On the other hand, unless the unfair land ownership patterns and economic exclusion are addressed, many South Africans simply do not share the “pain” of farmers, viewing them largely as a privileged white relic from the apartheid era. What hasn’t helped the farmers’ cause has been the recent spate of racist and dehumanising incidents where poor black farm workers have been attacked, assaulted and even killed. Just this past Friday, two white farmers were sentenced to 11 and 14 years imprisonment, for assaulting a black man, shoving him into a coffin, and threatening to set him alight in a case which made international headlines. The victim, Bokkie Potgieter, is believed to be in his 70s. He lived alone was found hacked to death in his bakkie near his Vryheid farm in KwaZulu-Natal. The attack occurred early Monday morning around 10am. “It appears as though Bokkie caught his attacker trying to steal his bakkie. It seems as though there was a struggle and Bokkie was chopped through the face with a panga‚” said Braam van Niekerk. The suspect subsequently put Potgieter’s body into his bakkie and drove off whilst the farmer’s feet were protruding from the window. The person who allegedly murdered Potgieter crashed the bakkie into a pole before being killed. “He crashed into a pole near the farm. Workers from neighbouring farms who were walking to work ran to the vehicle to try and help the driver‚ thinking he was injured. When they got there‚ they saw Bokkie’s body. The killer tried to run away but the farm workers caught and killed him,” added van Niekerk. Two people were hurt after a truck ploughed into them as they were protesting for Black Monday. Civil rights group AfriForum on Monday said attacks on South African farmers had strong racial and political links, condemning “reckless” remarks towards the farmers often made by politicians. “It is important that we create some context. It’s not just saying whether it’s black or white [farmers being killed]. I believe there is a political influence in some of these attacks. Sometimes we do hear racial utterances being said to victims of these attacks before they are murdered,” said Ian Cameron, AfriForum’s head of community safety. Cameron spoke to African News Agency at the historical Voortrekker Monument in Pretoria, where hundreds of protesters gathered for what has been dubbed #BlackMonday, a campaign raising alarm on the scourge of farm attacks and murders. “I think what is very important about today is that we realise that without farmers there is no future in this country. No one will eat, and no one will be able to have a sustainable living, and have a future to build in this country,” said Cameron. Cameron said reckless statements directed at white farmers by politicians like Economic Freedom Fighters leader Julius Malema have put farmers at risk. “We see people like Julius Malema saying very polarising things in the media, we see Malema saying things about specific racial groups, specifically farmers, and he makes generalisations that calls for these communities to feel a sense of polarisation, and divide. It’s important that politicians start taking responsibility. We see Fikile Mbalula, in a laughing matter, speaking about crime in Parliament as though it’s just a figure,” said Cameron. 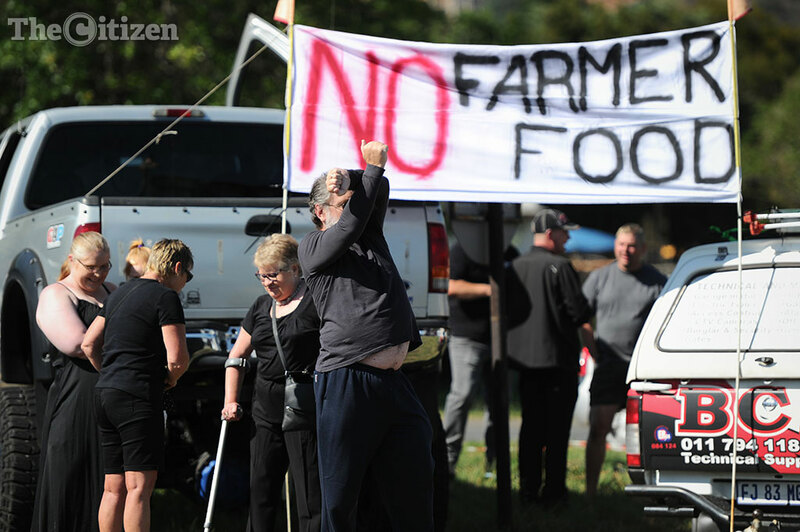 Protesters at the Pretoria side of the #BlackMonday protests urged the South African farmers to take control of their own safety. “I come from a farming community where we do have a lot of issues with farm attacks and farm murders. It is friends and family on farms, and currently they are not safe. I am here in support of them,” Pretoria resident Dirk Willem Nel told the African News Agency (ANA). Nel said if the current trend on farm attacks continued unabated, South Africa could experience food shortages as producing the food has become a life and death business. Nel was one of the hundreds of people gathered for a protest at the Voortrekker Monument on the outskirts of Pretoria. Wearing black and holding white crosses, the protesters laid down their small crosses near a giant cross erected in the historical park. The Democratic Alliance (DA) on Monday said the police was not doing enough to protect rural agriculture communities. According to Schäfer, seven women and children are murdered every day, and two people are killed in gang violence every day. “In a country where 74 people in rural communities have died at the hands of criminals in the past year alone, it is glaringly evident that our national police force is failing each and every South African citizen,” said Schäfer. She called upon the Western Cape MEC for Community Safety Dan Plato to investigate the failure of the South African Police Service (SAPS) in not protecting rural agriculture communities. “The SAPS must urgently enforce the Rural Safety Strategy, ensuring that rural police stations are fully equipped to protect our rural communities. These acts also affect Western Cape agriculture at large, by dissuading investors from investing in this sector which contributes a large portion to the Western Cape’s economy,” Schäfer said. She said it was impossible to cultivate an agriculture economy when the lives of farmers and their workers were in danger. Her comments come as a large convoy took part in a protest against farm killings, travelling from Stellenbosch to Cape Town on Monday. Schäfer called for calm in rural communities to allow police investigations into the recent murders to be conducted. The DA said the party would remain committed to protecting farmers that called the province home. “We owe it to our agricultural community to ensure not only their safety, but their livelihoods in our province as well,” said Schäfer. Police Minister Fikile Mbalula is part of the problem in the ongoing scourge of farm attacks and murders that have left South African farmers fearing for their lives, civil rights group AfriForum on Monday. “We do not get feedback from the minister, so we believe that the minister is part of the problem at this stage. We will continue to put pressure on government, but we are not going to align our campaign in such a way that the solution will, at the end of the day, depend on the minister,” AfriForum deputy CEO Ernst Roets told African News Agency (ANA) in Pretoria. He was speaking at a farm murder protest at Voortrekker Monument, in the south of Pretoria, where protesters dressed in black gathered. Thousands of people took to the streets in different parts of South Africa, in a protest dubbed #BlackMonday, raising international awareness on the attacks and killings of farmers in the country. Several major roads were blockaded in Cape Town and in Pretoria. AfriForum has consistently criticised Mbalula for failing to release specific figures and statistics of farm attacks and murders when he tabled the 2016/17 crime statistics in parliament last week. “Yesterday [Tuesday] the crime statistics were released by the minister of police, and we heard the horrible numbers that South Africa’s murder ratio has increased yet again. In the last year, there was 19 016 murders in South Africa, which means there was about two murders every hour – for an entire year. “That really indicates that South Africa is in fact a very violent country, and suffering from extreme levels of crime, which is very concerning to us,” said Roets last week. “What is even more concerning relating to this particular topic is the fact that once again no statistics regarding farm attacks were released yesterday. There was a question to that effect posed to the minister to which he responded by declining or refraining from providing any numbers. Roets took issue with Mbalula’s response. He said the last farm attacks and murders statistics were made public in 2007. “Of course horrible incidents happen, but we believe it was very inappropriate for the minister of police to respond like that when people ask why there are no statistics on farm killings,” he said. AfriForum said there was clearly an increase in farm attacks and murders on South African farms. “We know that our data in terms of farm attacks is insufficient because we know that a farm attack where no one is killed is not newsworthy anymore. It happens literally almost every day in South Africa, but we do find that farm murders [attacks] where people are killed are still reported unfortunately in some media publications more than others,” said Roets. On Tuesday, Mbalula had said farmers should ensure they were compliant with the country’s laws and also desist from hiring undocumented foreigners. A convoy of hundreds of vehicles carrying people protesting against the killing of farmers and farm labourers was slowly making its way to Cape Town on Monday morning. The #BlackMonday protest started at Kanonkop in Stellenbosch and then proceeded on the R44 and the R101, from where it was scheduled to travel along the key transport corridor of Voortrekker Road before finishing at the Cape Town stadium. The organisers had initially requested to have the convoy proceed on the N1 highway into the city centre but this was refused by authorities on Sunday. However, Richard Bosman, the executive director for safety and security in the City of Cape Town, said that a splinter group had managed to make its way onto the N1 and by midmorning was at the Plattekloof turn-off. Organisers are expecting a convoy of around 500 vehicles and 2,000 people at the main protest in Cape Town although there were other smaller protests around the country, most notably in the capital Pretoria at the Voortrekker monument. Joubert Conradie was shot dead on his farm in Klapmuts, near Stellenbosch, last week, sparking the idea for the protest. At least 18 000 people and 5 000 vehicles have gathered at Kanonkop, a farm in Klapmuts near Stellenbosch, in protest against farm murders. The City of Cape Town’s Richard Bosman said the group “Genoeg is Genoeg” (Enough is Enough) was given a permit to stage demonstrations on Sunday, but the number of people gathered has far exceeded what the City planned for. Bosman said the protesters are expected to head into the Mother City later on Monday morning. They will head towards Joostenbergvlakte and will use Voortrekker Road, through to Bellville; Parow, Goodwood, Kensington and the Maitland area to head into Cape Town at 9 am. The South African Police Service (SAPS) will accompany the protesters. Bosman said the gathering, so far, was peaceful. He said Capetonians can expect major traffic delays, despite the group not using the N1.